We hope you have your salt shakers nearby because Digitimes is treating us to another rumor. This time we are dealing with a leak regarding the upcoming HTC Puccini – the company's 10-inch tablet that is expected to be announced later this year. According to a tipster that allegedly works for one of HTC's touchscreen suppliers, the HTC Puccini is only a few steps away from entering mass production. The tablet is said to be hitting the conveyer lines as soon as HTC is done testing it, which might happen as soon as next month. We also hear the same 1.5 GHz Qualcomm MSM8660 chipset being mentioned, and Android 3.0.1 being quoted as the operating system of choice. 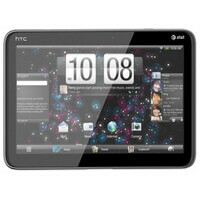 If the rumor does turn out to be true, it wouldn't be surprising to see the HTC Puccini joining AT&T's lineup of tablets in the third or fourth quarter of 2011. It is also quite likely to see the tablet launch bearing a different name as these preliminary monickers usually refer to prototype models only. What we are still unsure about, however, is whether the device will have both Wi-Fi-only and 4G-enabled versions, and if so, whether they will launch at the same time or not. We are hoping to hear more news about the HTC Puccini soon, but until then, we will have to console ourselves only with these leaked Sense 3 screenshots running on it. If this comes in a Wi-FI only version... I'm buying one!